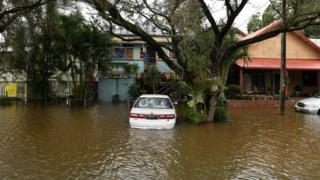 Australian authorities fear people may have drowned as a flood emergency grips two states in the wake of Cyclone Debbie. Tens of thousands of residents have evacuated homes in northern New South Wales (NSW) and southern Queensland. The storm has moved out to sea after hitting northern Queensland as a category four cyclone on Tuesday. However, floodwaters continue to rise after some areas had about three times their monthly rainfall on Thursday. "There could be people overnight that perished in that flood, we don't know at this stage," said Mark Morrow, from the New South Wales State Emergency Service. "There could be some very distressing news." Many pleas for help had gone unanswered because it was too dangerous, he said. The worst-hit areas included Lismore and Tweed Heads in NSW, and the Gold Coast and Beaudesert in Queensland. "Now is the time to leave. Do not delay. Evacuation orders are mandatory," New South Wales State Emergency Service said on Twitter on Thursday. Authorities said flooding in some towns had not yet reached its peak. The cyclone caused major damage to buildings, roads and crops when arrived on Tuesday carrying winds of up to 260 km/h (160 mph). Tourism operators across Queensland reported cancelled bookings and anticipated long-term disruption to their trade. Thousands of insurance claims have already been filed, but the state's insurers said it was too early to accurately assess the cost of the damage. The cyclone is also likely to have damaged the Great Barrier Reef, marine experts warned.